For more information, please contact Kelly Masse of the Hockey Hall of Fame at 416-933-8212. Click here to print the Ticket Application Form. TORONTO (October 30, 2008)  The Hockey Hall of Fame announced today that Honoured Members Paul Coffey, Jari Kurri and Mark Messier will join former teammate and 2008 Inductee Glenn Anderson for the 2008 Source For Sports Hockey Hall of Fame Legends Classic Game. The game, featuring a record total of 19 Honoured Members, will be played Sunday, November 9 at 2:00 p.m. at the Air Canada Centre in Toronto. 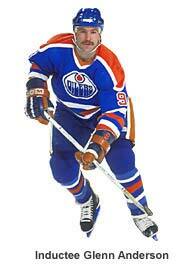 "Stepping onto the ice again with Mark, Paul and Jari will be a real thrill for me," said Glenn Anderson, the former Oilers great who will be inducted into the Hockey Hall of Fame in the Player Category on Monday November 10, 2008. "It's a great honour to have the support system back in place as we once did." The Legends Classic, as part of the Hockey Hall of Fame's year-long tribute to the Montreal Canadiens centennial anniversary, will feature three former Montreal Canadiens Captains  Yvan Cournoyer, Vincent Damphousse and Kirk Muller. The Captains will suit up for the Montreal Legends who will take on the All Star Legends. The group of participating players has combined to win 75 Stanley Cup rings. Prior to the game, the 2008 Inductees: Glenn Anderson, Ed Chynoweth (posthumously), Igor Larionov and Ray Scapinello will be presented with their official Honoured Member Blazer. Canadian rock icon, Kim Mitchell, will perform live during the half-time show and post-game encore. Legends Classic tickets are available at www.ticketmaster.ca. TORONTO (June 17, 2008)  Bill Hay, Chairman of the Hockey Hall of Fame's Board of Directors and Jim Gregory, Chairman of the Hockey Hall of Fame's Selection Committee, announced today that Glenn Anderson and Igor Larionov have been elected to the Hockey Hall of Fame in the Player Category. In the Builder Category, Ed Chynoweth was posthumously elected. In the Referee/Linesman Category, Ray Scapinello was elected. The vote took place today at the annual meeting of the Selection Committee in Toronto. "The Hockey Hall of Fame is proud to welcome these four hockey legends as Honoured Members," said Jim Gregory. "Their contributions to the game of hockey are well documented and their election to the Hockey Hall of Fame is richly deserved." Glenn Anderson hails from Burnaby, British Columbia where he played for the Bellingham Blazers and the University of Denver before being drafted by the Edmonton Oilers 69th overall in the 1979 entry draft. He played in Edmonton for 11 seasons, concluding his Oilers' stint in 1990-91. Glenn was consistently near the top of the NHL in scoring and thrived in the playoffs, scoring overtime winners and game-clinching goals in each of Edmonton's five marches to the Stanley Cup between 1984 and 1990. In 1991, Anderson was traded to the Toronto Maple Leafs where he became one of the Leafs' top scorers and once again a playoff leader, as Toronto made it to within one game of the Cup final in 1993. "It's a great phone call to receive from Jim Gregory," said Anderson. "It is an honour to go in and join many of my Edmonton Oilers' teammates, I know they have been very supportive, which means a lot." Igor Larionov was already one of the top hockey players in the world when he made his NHL debut in 1989 at the age of 29. A native of Voskresensk in the former USSR, Larionov won eight consecutive Russian League Championships with CSKA Moscow in the Soviet Elite League and was named Player of the Year in 1988. He captured eight gold medals in international play, including two Olympic gold medals (1984 and 1988). Igor played for the Vancouver Canucks from 1989 to 1992, the San Jose Sharks from 1993 to 1995 and then the Detroit Red Wings for eight seasons  including three Stanley Cup championships. 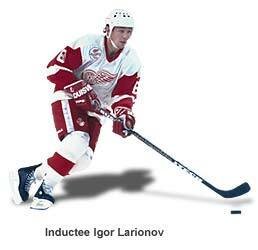 "This is very exciting news, I can't really put into words or to describe what this honour means to me", said Larionov. "It's very touching to know that I will be celebrating one of the top accomplishments in my hockey career by being inducted into the Hockey Hall of Fame. So many great players from the 1900s to the current day are in the Hockey Hall of Fame. This truly is a great honour." In the Builder Category, former Western Hockey League Commissioner Ed Chynoweth was elected posthumously. The native of Dodsland, Saskatchewan became the first full-time President of the Western Canada Hockey League (now WHL) in November of 1972. He was a founder of the Canadian Major Junior Hockey League (now CHL) in 1973 and served as CHL President for 20 years. Ed Chynoweth passed away on April 22nd, 2008. "This is a tremendous honour for my father," said his son Dean Chynoweth. "My father had a passion for the game of hockey and was committed to doing whatever it took to improve the game. Our entire family is very proud." Ray Scapinello was elected in the Referee/Linesman Category. He played minor hockey in Hespeler, Ontario and after retiring from Junior C hockey he began his career as an official as a 20-year-old in Guelph. Three years later in 1971, Ray began his career as an NHL linesman. He was named the NHL's "best in the business" a record 20 times. In 33 years as an NHL official  2,508 regular season and 426 playoffs games  Scapinello never missed a game. "When I started in this business my mindset was to keep working so I never could have imagined this," said Scapinello. "I am very appreciative that former Referee-In-Chief Scotty Morrison took a chance and gave me the opportunity to have so many enjoyable years in the NHL." The 2008 Induction Celebration will be held on Monday, November 10th at the Hockey Hall of Fame in Toronto. Born on October 2, 1960 in Burnaby, British Columbia. Played one season in the B.C. Junior Hockey League for the Bellingham Blazers, recording 62 goals, 131 points, and was named to the BCJHL's Second All-Star Team. Played one season for the University of Denver Pioneers where he recorded 55 points in 40 games. Drafted as Edmonton Oilers' 3rd pick, 69th overall, in the 1979 NHL Entry Draft. Played 1979-80 season for Canada's National Team, touring Europe and participating in 1980 Winter Olympics. Following Olympics, finished season with Seattle Breakers of the WHL. First NHL season, 1980-81 with Edmonton Oilers. Played 11 seasons for the Edmonton Oilers (1980-91). Recorded four consecutive 40+ goal seasons. Recorded 30+ goals in 9 of 16 seasons. Recorded career-high 54 goals in 1983-84 and 1985-86. Recorded three 100+ point seasons. Recorded career-high 105 points in 1981-82. Played in four NHL All-Star Games (1984, 1985, 1986, 1988) and in Rendez-vous '87. Captured five Stanley Cup Championships with Edmonton, scoring overtime winners and game-clinching goals in each of the team's Stanley Cup Championships (1984, 1985, 1987, 1988, 1990). Traded to Toronto Maple Leafs on September 19, 1991. Played 2 ½ seasons for Toronto Maple Leafs (1991-1994). Traded to New York Rangers on March 21, 1994. Captured 1993-94 Stanley Cup Championship. Played final three seasons of career with Augsburg Panthers (Germany), Lukko Raumo (Finland), Canadian National Team, St. Louis Blues, Edmonton Oilers, St. Louis Blues and HC La Chaux-de-Fonds (Switzerland). Recorded career NHL regular season totals of 1,129gp, 498g, 601a, for 1,099 points. Recorded career NHL playoff totals of 225gp, 93g, 121a, for 214 points. 40th NHL player to record 1,000 career points. Captured six Stanley Cup Championships. Member of Team Canada at 1980 Olympics. Captured championships with Team Canada at 1984 & 1987 Canada Cups. Member of Team Canada at 1989 & 1992 World Championships, capturing a silver medal in 1989. Born on December 3, 1960 in Voskresensk, USSR. Belonged to Khimik Voskresensk club team from a very young age. Joined Khimik Voskresensk senior club beginning in 1977-78. Played 4 seasons for Khimik Voskresensk in the Soviet Elite League. Moved to CSKA Moscow for the 1981-82 season. Played 8 seasons for CSKA Moscow in the Soviet Elite League. Captured 8 consecutive Russian League Championships. 1st Russian Team All-Star Centre on four occasions (1983 & 1986-88). Named USSR's Player-of-the-Year in 1988. Member of Soviet National Team at European Junior Championship in 1978, capturing a silver medal. Member of Soviet National Team at World Junior Championship in 1979 & 1980, capturing two gold medals. Named IIHF World Junior Championship All-Star Team Centre of 1980 tournament. Member of Soviet National Team at World Championship, 6 times, 1982-83, 1985-87 & 1989, winning 4 gold medals. Named IIHF World Championship All-Star Centre twice, 1983 & 1986. Member of Soviet National Team at Winter Olympic Games in 1984 & 1988, and of Russian Team in 2002, winning two gold medals (1984, 1988) & one bronze (2002). Member of Soviet National Team at 1981, 1984 & 1987 Canada Cups, capturing 1981 Canada Cup championship. Member of Russian National Team at 1996 World Cup of Hockey. Participated in Super Series Exhibition versus NHL clubs in 1983 & 1989, as well as Rendez-vous '87. Originally Vancouver Canucks' 11th pick, 214th overall, in 1985 NHL Entry Draft. Joined the Vancouver Canucks at age 29. Played 3 seasons with the Vancouver Canucks (1989-92). Played 1 season with HC Lugano in Swiss Elite League (1992-93). Claimed by San Jose Sharks in 1992 NHL Waiver Draft. Played 3 seasons with the San Jose Sharks (1993-95). Traded to Detroit Red Wings on October 24, 1995. Played 8 seasons with Detroit Red Wings (1995-00 & 2000-03) where he captured 3 Stanley Cup Championships in 1997, 1998 & 2002. Recorded 71 points in 69 games in 1995-96 regular season. Played start of 2000-01 season with Florida Panthers. Signed as a free agent & played one season with New Jersey Devils in 2003-04. Retired following the 2003-04 season. Played 2 games for Brunlo IK, Swedish Tier III League, in 2005-06. Recorded career NHL regular season totals of 921gp, 169g, 475a, 644 points. Recorded career NHL playoff totals of 150gp, 30g, 67a, 97 points. Participated in 1998 NHL All-Star Game. Born in Dodsland, Saskatchewan and raised in Coleville, Saskatchewan. Would spend 20 years in Saskatoon, Saskatchewan before moving to Calgary, Alberta in 1976. Married with two sons, Jeff & Dean, who are both General Managers for WHL franchises. Former President of the Saskatoon Minor Hockey Association. Assistant General Manager of the Saskatoon Blades in 1971-72. Became first full-time President of the Western Canada Hockey League (now WHL) in November of 1972. President of the WHL from 1972-96 with the exception of 1979-80 when he was the minority partner & general manager of the Calgary Wranglers. One of the founders of the Canadian Major Junior Hockey League (now CHL) in 1973-74. Chairman of the 1974 Memorial Cup, and all other Memorial Cups hosted by the WHL. Became the first CMJHL President in 1975-76, a position held consecutively until June, 1995. Awarded a WHL expansion franchise, the Edmonton Ice, on August 5, 1995. Governor & President of the Edmonton Ice from 1996-98. Relocated Edmonton Ice franchise to Cranbrook, B.C., becoming Kootenay Ice in 1998. Governor & President of the Kootenay Ice from 1998-2008. WHL Chairman of the Board from 1996-98 and 2004-07. Played instrumental role in getting the CMJHL and the CAHA to form a committee to oversee and operate Canada's World Junior Team program. Appointed to the Federal Government Commission of Fair Play in 1986. Appointed to the International Centre of Excellence & Hockey Development Committee in 1987. Winner of the CMJHL Distinguished Service Award in 1977 & 1983. Awarded the CAHA Order of Merit in 1986 for service to Canadian Amateur Hockey. Top Scorer Award at the Memorial Cup named the Ed Chynoweth Trophy in 1996. Inducted into the Alberta Sports Hall of Fame in May, 2000. The WHL Championship Trophy was renamed the Ed Chynoweth Cup in May, 2007. Passed away in Calgary, Alberta on April 22, 2008. Served on the Hockey Hall of Fame Selection Committee from 1990 until his passing in 2008. 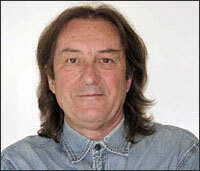 Born November 5, 1946 in Guelph, Ontario. Played minor hockey in Hespeler, Ontario. Played Junior and Senior Hockey in Guelph with the Platers, and the Guelph Regals. Bill McCreary's future father in law Mel McPhee convinced him to become an official. 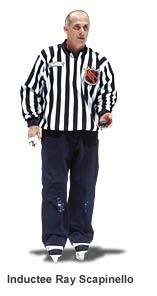 Joined the Guelph Referees Association in the late 60's, officiated amateur and junior leagues. Attended the Bruce Hood school of Officiating in 1968. Officiated in an Outlaw Junior League and the Ontario Hockey Association level before being noticed by Frank Udvari and Scotty Morrison of the NHL. Invited to NHL Officials camp in 1970 ... but didn't get hired. Came back a year later and got invited to NHL rookie camp. Officiated AHL games on weekends while holding a full time job in Guelph. 1971-72 season was first National Hockey League season. 1st game in Buffalo...October 17, 1971 Minnesota North Stars vs. Buffalo Sabres. February 26, 1997 in Toronto, he officiated his 2,000th game. Friday April 2, 2004 officiated his 2,500th and his last regular season game; Toronto Maple Leafs vs. Buffalo Sabres in Buffalo. Officiated in 426 Stanley Cup playoff games. 20 years in Stanley Cup Finals. Officiated in 3 NHL All Star game. Was one of the first professional officials to referee at the Olympics, at the 1998 Nagano Winter Olympic Games. Never missed a game in 33 years as an NHL Official. 20 times he was named "best in the business". In 2006 started the Ray Scapinello Foundation ... to help Guelph-area students pay for College. Annual holds the Ray Scapinello Road Hockey Tournament to raise monies for local charities. Officiating Supervisor for the Central Hockey League 2005 to present. TORONTO (May 29, 2008)  Bill Hay, Chairman of the Hockey Hall of Fame, announced today that long time Canadian Press reporter Neil Stevens will receive the Elmer Ferguson Memorial Award for print journalism and that Mike 'Doc' Emrick, widely recognized as the voice of the NHL in the United States, will receive the Foster Hewitt Memorial Award for outstanding contributions as a hockey broadcaster. Neil Stevens has worked for the Canadian Press wire service for more than 30 years, making him a hockey reporter in the truest sense of the word. Over the course of his career the native of Port Dalhousie, Ontario, has covered 20 Stanley Cup finals, two World Cups of Hockey, six Winter Olympic hockey tournaments, four World Championships and several Memorial Cups. "As a wire service journalist, Neil Stevens' name didn't always appear in the newspaper, but he might have been the most widely read hockey writer in Canada for the past 30 years," said Kevin Allen, President, Professional Hockey Writers Association. "He's an old school reporter who can craft a game story in 30 minutes and make readers feel like they were there. His longevity as a Canadian Press hockey writer says volumes about how well he mastered his craft." 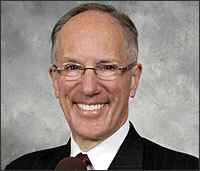 Since 2005 Mike Emrick has been the lead play-by-play announcer for the NHL on Versus and the NHL on NBC. 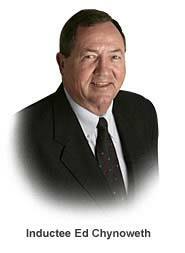 He began his hockey-broadcasting career in 1973 calling games for the IHL Port Huron Flags. Over the past two decades, he has served as the voice of the Flyers in Philadelphia, of the Rangers in New York, and most recently as the voice of the Devils in New Jersey. "Mike has been the pre-eminent hockey play-by-play broadcaster in the United States for many years," said Chuck Kaiton, President, NHL Broadcasters' Association. "His dedication to hockey and his enthusiasm for broadcasting make him worthy of this honor." Stevens and Emrick will receive the awards at a luncheon presentation on Monday, November 10, 2008. This year's Hockey Hall of Fame Induction Weekend will take place November 7th to 9th, culminating with the live broadcast of the Induction Ceremony beginning at 7:30 P.M. (EST) on Monday, November 10 on TSN's alternate digital feed (which will be rebroadcast in its entirety on TSN at 7:30 P.M. (EST) on Wednesday, November 12th). This year's Hockey Hall of Fame Inductees will be announced on Tuesday, June 17, 2008, following the annual Selection Committee meeting that same day. The Foster Hewitt Memorial Award is named in honour of the late "Voice of Hockey" in Canada. It was first presented in 1984 by the NHL Broadcasters' Association in recognition of members of the radio and television industry who have made outstanding contributions to their profession and to the game of hockey. Named in honour of the late Montréal newspaper reporter, the Elmer Ferguson Memorial Award was first presented in 1984 by the Professional Hockey Writers' Association in recognition of distinguished members of the newspaper profession whose words have brought honour to journalism and to the game of hockey. Elmer Ferguson presided over the sports desk of the Montréal Herald until he died, at the age of 87, in 1972. Ferguson's longevity and encyclopedic knowledge of hockey earned him the respect of his industry, while his insightful and sardonic comments earned him an international following of hockey fans. In March 1923, Foster Hewitt aired one of the first hockey radio broadcasts. From that night on he became the eyes and ears of radio listeners and television viewers across Canada. Hewitt described thousands of hockey games, including national, World and Olympic championships in Canada, the United States and Europe.